Boil some water and soak soya nuggets in it. Keep covered for 15 mins. Meanwhile peel and cube the potatoes. Cook covered in a microwave safe bowl with little water for 6-7 mins. Drain excess water and keep aside. Drain the hot water from nuggets and add some cold water. Take few in your hands and squeeze out the water completely. Mince the soya nuggets in a grinder or food processor bowl and keep aside. Heat 2-3 tbsp oil in a pan and add onions and saute till translucent. Add ginger, green chilis, curry leaves and salt and mix well. Add minced soya nuggets and mix well. Add pepper powder and garam masala and mix well. Mash the potato with a fork and add to cooled soya mixture. Add little beaten egg and mix well. Make small rounds and shape the way you desire. Dip in rest of beaten egg and roll in bread crumbs. Either deep fry or shallow fry the cutlets. Boil corn for 10 mins and drain well. Add a handful of corn to a bowl. Transfer the rest to a blender and pulse to a coarse paste and add to the bowl. Add mashed potatoes, cheese, corn flour, salt and pepper and any other optional items to the bowl and mix well. Dip in corn flour batter and roll in breadcrumbs. Serve with ketchup or chutney of your choice. Whisk flour, baking powder, baking soda, garlic powder, cayenne , sugar and salt in a large bowl. In a smaller bowl, stir buttermilk and melted butter. Butter will form small clumps. Add to the flour mixture and mix gently with a rubber spatula till all flour is mixed. Either use a big spoon to scoop out the mixture and place on a greased or parchment covered baking tray or use your hands to grab small portions, form rounds and gently press to flatten and place on the tray. Leave some space between the biscuits. 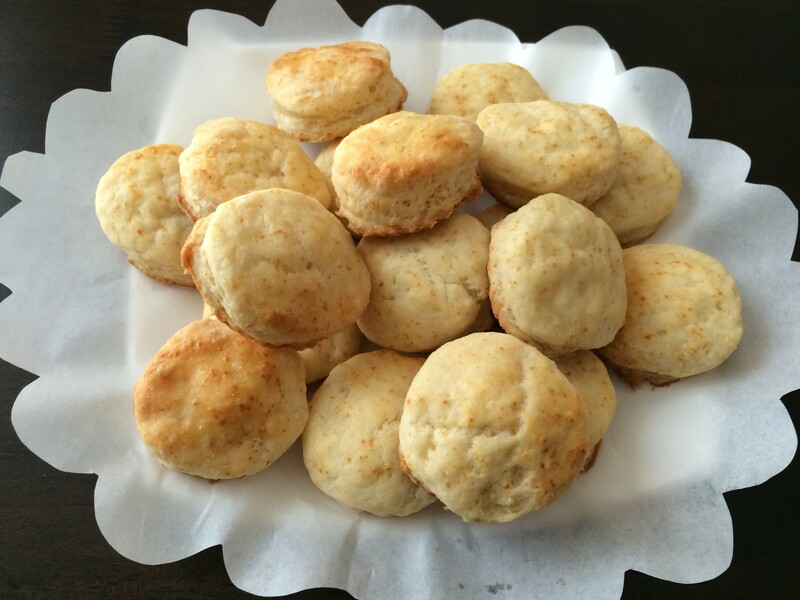 Bake in a preheated oven at 180 degree celsius for 12-15 mins or until the biscuits start to become golden brown. While the biscuits are baking, melt the butter for topping and add garlic powder and parsley. 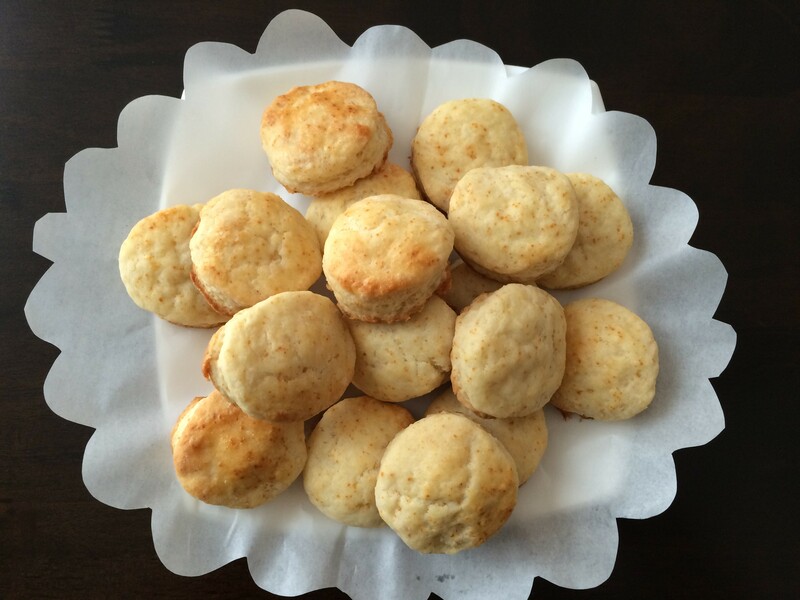 As soon as you take the biscuits out of oven, brush the melted butter on top. The potatoes have to be parboiled. Boil 5-6 cups of water with some salt in a large pan and add potatoes. It’s ok to add both sizes together. Cook till the potatoes are half cooked and drain. Mix Indian spices in a bowl and add cubed potatoes pieces and mix well. Mix garlic herb spices in another bowl and add quartered potato pieces and mix well. Transfer the potatoes to a baking tray. Bake and broil in a preheated oven at 180 degree Celsius for 10-15 mins or until the potatoes start to crisp on the outside. Preheat oven at 150 degrees Celsius. Remove the sides of white or brown bread. Roll each with a rolling pin. Lightly grease a mini muffin pan with oil. Place one slice in each mold and slightly push down to hold shape. Place in the oven for 8-10 mins. You can transfer the half-baked ones to another flat tray (side by side in oven) and use the muffin tin for second batch. It becomes crispy when cool. Or once all are done, switch off the oven and leave the bread bowls in the oven for half hr. Stays crispy for 2 days in an airtight container. Place 1 tsp stuffing in bread bowls and serve. Stuffing ideas: Place in cool bread bowls just before serving. 1. Heat 2 tsp oil. Saute 1 tsp ginger and garlic, half chopped onion. Add ½ cup cooked minced meat or chicken. Add seasoning of your choice, ½ chopped tomato. Saute till almost dry. Add chopped coriander leaves and mix. Cool mixture. 2. Mix 1 medium boiled potato cut into small cubes, 4 tbsp chopped onion, 2 tbsp chopped coriander leaves, ¼ tsp red chili flakes, 2-3 tbsp tamarind sauce. 5. Any leftover finely chopped!! Add flour, salt, ajwain and shortening in a bowl. Rub shortening and flour with your fingers to resemble bread crumbs. Add enough water to make stiff dough. Drain excess water and mash with a fork. Leave few small pieces intact. Add coriander seeds, fennel, black salt if using, chili and coriander leaves. Check seasoning and keep aside. 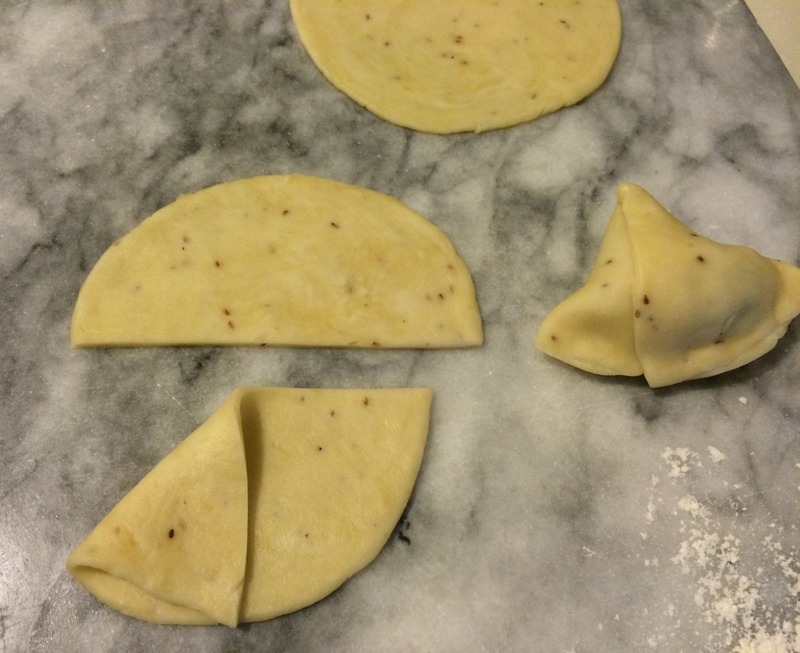 Make lemon size balls of the dough and roll to rounds of uniform thickness. Keep covered otherwise they dry out. Two ways to use the wrapper. Cut rounds into 2. 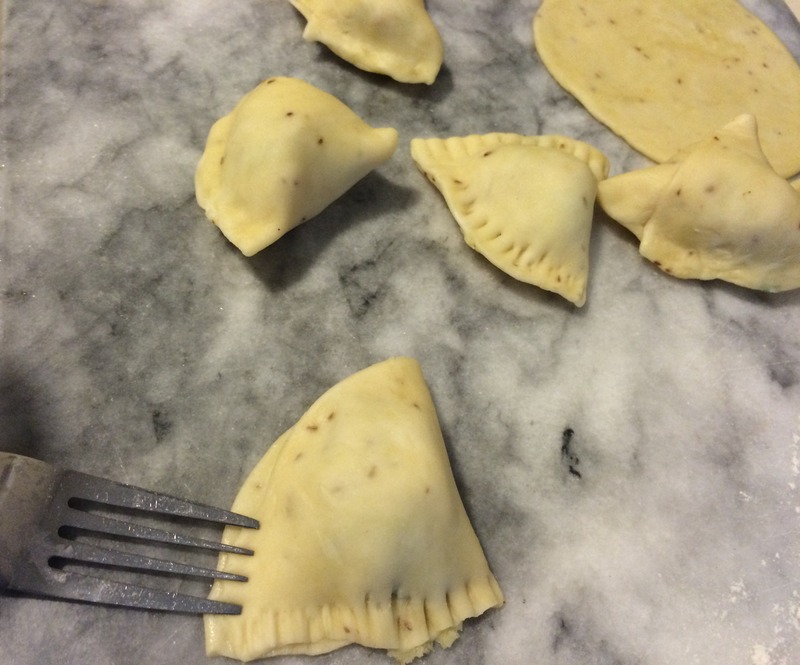 Take a heaped tsp of filling and place on one side of wrapper. Dip your finger in water and run around the edges. Fold the other half over the filling. Press lightly with your finger and use a fork to close out completely. This is the easiest method. 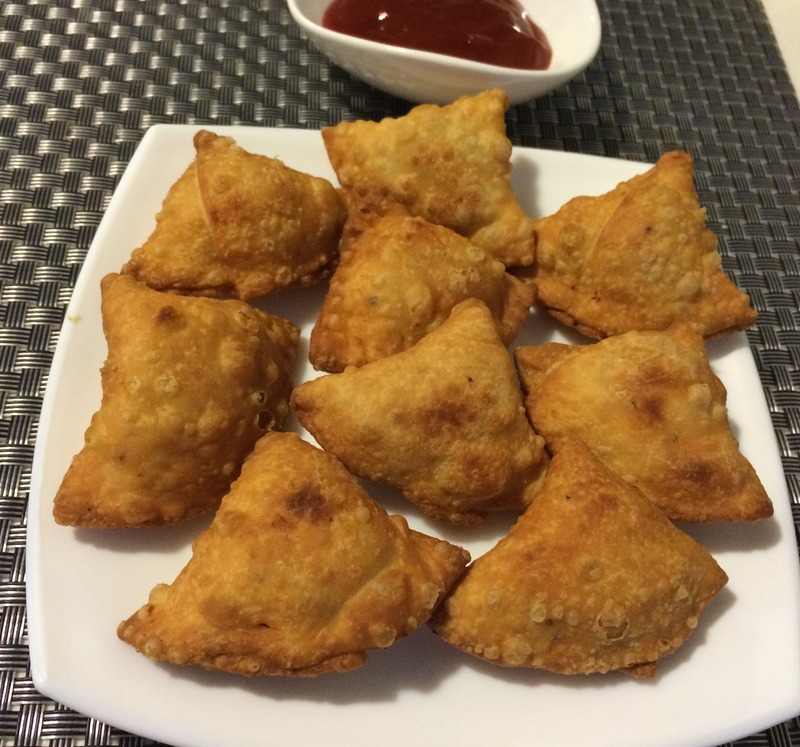 For regular samosa shape, see picture. Fold half of the wrapper. Rub water on the edge and place the other side edge over it. Press with fingers to close. Now fill the cone. Again rub water over the edges and press to seal the edges. Keep covered till all wrappers are used up. Heat oil and fry few samosas at a time. Keep medium heat so it cooks and browns evenly. 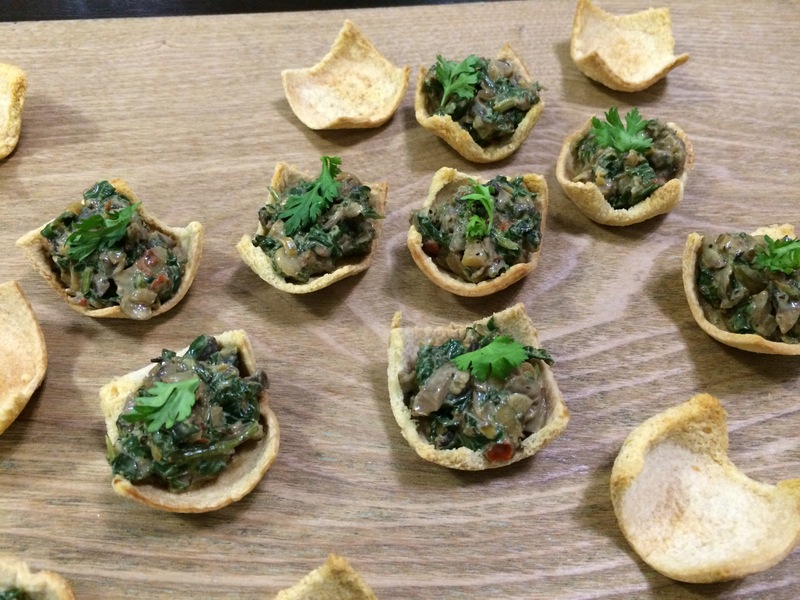 Serve with ketchup or green chutney. Mix yogurt and salt and place in a muslin cloth. Tie the cloth and hang it such way that all water drips out. 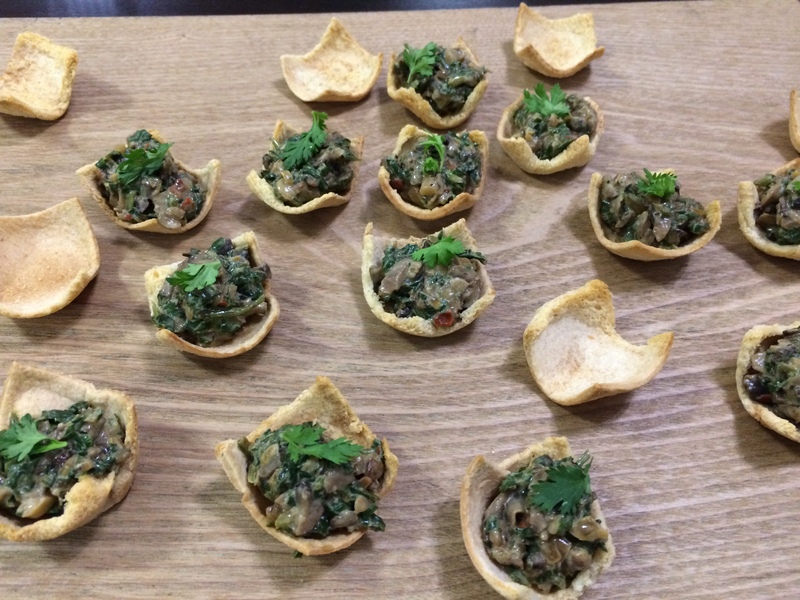 Take the labneh out of the muslin cloth and make small balls. 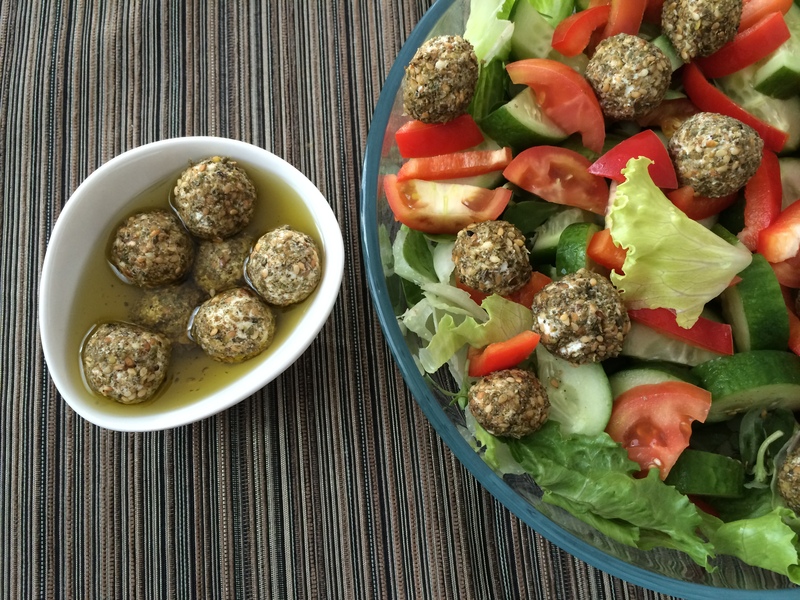 Roll in zaatar and serve with salads if using immediately. For storing, put them in a clean glass jar and cover with olive oil. You can mix fresh finely chopped herbs like parsley before making balls. Use as a dip for crackers. Wash and wipe the brinjals. Cut horizontally into two and scoop out the inside leaving ½ “ thick skin. Rub little oil inside and sprinkle salt. Chop the scooped flesh to small pieces. Heat 2 tbsp oil and add garlic and saute. Add onion and chili flakes and saute for a minute. Add scooped brinjal flesh and mix well. Saute on medium heat for a few minutes. Check seasoning, add mint leaves and take off fire. Fill the brinjals boats with this mixture. Scatter few cherry tomatoes and sprinkle feta cheese. 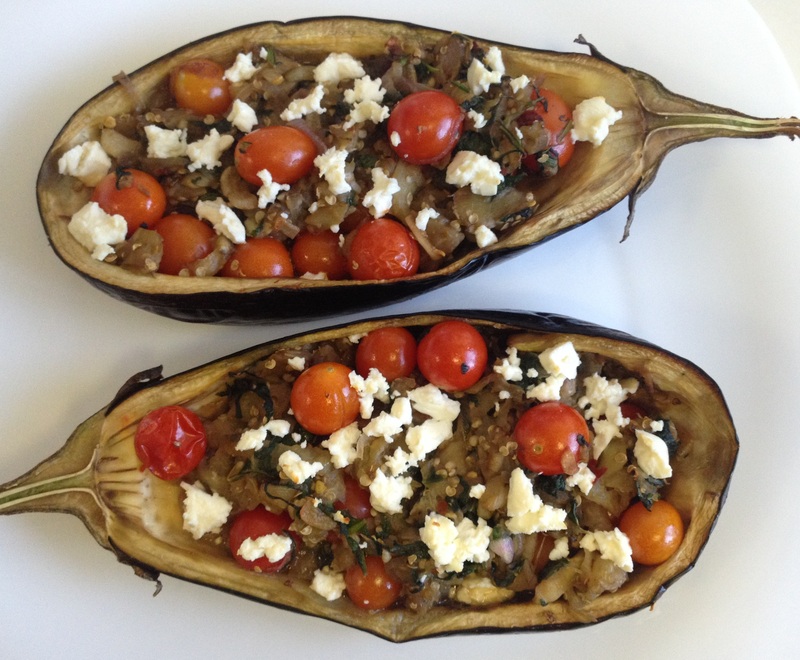 Bake in a preheated oven at 180 degree Celsius for 20-30 minutes or until the brinjals skin is cooked and soft.